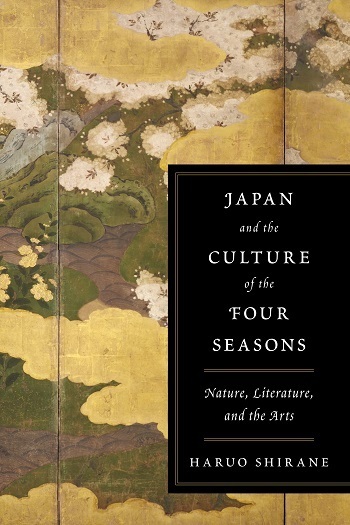 Book Review: Japan and the Culture of the Four Seasons | Ready, Set, Kimono! I have quite an extensive library of kimono books on my shelf. Some are in English, some are in Japanese, and some are bilingual. I use some of them almost daily, and some of them I rarely look at. I’d love to share some of my collection with you, and so I’ve decided to start doing book reviews. This first review is on a book called Japan and the Culture of the Four Seasons by Haruo Shirane. Never heard of it? I’m not surprised. My reading tastes are very peculiar and eclectic. The easiest way to get me to NOT read is to put it on a bestseller list or to make a movie out of it. I think the only reason I love Harry Potter so much is that I heard about it through word of mouth before it became immensely popular. By then, it was too late. I had already read the first three books and I wasn’t going to stop! But back to kimono. Or rather, kimono books. For each review, I’ll give an outline of what topics are covered. For this book, I’ve decided to do it by chapters. After that, I’ll give you my opinion, both the good and the bad, along with some final thoughts about the book. Shirane’s overall argument for this book is that the seasonalisation of motifs is a cultural construction that was based on the Imperial court in Kyoto during the Heian period. These nobles rarely left the palace, so the only nature they were exposed to was the recreated nature of the gardens. This is the reason you will never see a wild boar as a classical motif on a kimono. In the introduction, Shirane debates the opposing viewpoints that Japanese people accept nature while western cultures try to fight against it. He also explains the old calendar that was used in the Heian court and that was used to assign seasonality to different motifs. This calendar is about six weeks later than the modern calendar and this difference explains some of the complications in kimono seasonality such as autumn motifs being acceptable in August (according to the classical calendar, August was considered autumn). This chapter examines Imperial anthologies of waka poetry and what they can tell us about the development of seasonality. Shirane starts by instructing us on the mindset of the Heian poet; that they were writing for an audience that implicitly understood the feelings and connections associated with each image they presented. “My love is like a rose” is not a phrase that would be used. Instead the poet would just use “rose” and rely on the reader to interpret “love” from it. The author also looks at several anthologies chronologically and charts the course of which seasons held prominence to the writers (at first it was only spring and autumn) and which motifs were used to express these seasons. Finally, he also talks about cultural creations of seasonality such as the moon or the deer (which exist all year round) coming to represent autumn and why this happened. This chapter looks at how the seasonality established by waka poetry was expressed in various visual media, including the juni hitoe. Shirane lists several colour combinations that conveyed different motifs for different seasons. He also talks about kosode from the Edo period. During this time, kosode would sometimes have some of the characters from certain famous poems as part of the design. It would be up to the watcher to see these kanji and remember the poem and thus understand the seasonality of the kosode. He also looks at screen paintings and the development of twelve-month paintings (one panel for each month) which further refined the list of plant, flower, and bird motifs that were associated with each month. This chapter looks at the habit of bringing the secondary nature created outside in the garden into the rooms of the palace. This was done partially through the art of ikebana, which he describes in great detail, but also through the construction of the palace itself. Features such as verandas, gardens that are viewable from inside the building, and alcoves decorated with seasonal flowers were also key features of bringing nature closer to the living space. This chapter also talks about the use of seasonal flowers in tea ceremony. In this chapter, Shirane looks at the difference between the secondary nature of the court and the nature experienced by the common people on farms, in the fields, and in the forest and mountains. Low ranking aristocrats and Buddhist priests were the authors of these texts, and in them, natural phenomenon were often associated with the gods, or they were viewed as bridges to other worlds. The dichotomy of “classical motifs” and “common motifs” is incredibly interesting. Most of the motifs are very different, however when they are the same, they will signal different things to different audiences. For example, the first cry of the hototogisu (a type of cuckoo bird) was seen as a sign of summer (classical) and also a sign to start planting the rice (common). In this chapter, Shirane talks about motifs that have transcended traditional seasonal restrictions to become auspicious motifs that are acceptable all year round. These include motifs like pine, bamboo, the crane, and the turtle. In addition to individual motifs, Shirane also talks about auspicious topography and the notion of four seasons and four directions. He also tries to clarify the difference between a motif as a motif, and a motif as a talisman. In this chapter, Shirane talks about the annual observances that divided up the year. In particular, he talks about the significance and impact of the Five Sacred Festivals (gosekku) which occurred on the first day of the first month, the third day of the third month, the fifth day of the fifth month, the seventh day of the seventh month, and the ninth day of the ninth month. In addition, Shirane talks about famous places that people would visit in order to see seasonal displays (the first examples of hanami and momijigari). This chapter talks about the rise of haikai poetry in the Edo period and the departure from purely classical literature to poems written by the common people. Shirai describes a seasonal pyramid with refined, classical seasonal motifs at the top (such as cherry and plum blossoms) all the way down to new motifs that were introduced from the experiences of the common people (such as dandelion and garlic). During this time of literature development, seasonal food and fish also became seasonal motifs. This book is one the most used books in my kimono library. I love the fact that it gives the history and background on motifs and this has broadened my understanding of them too. My favourite part of this book is the index. It’s divided up into the four seasons, and within each season, each motif is listed twice, once under its Japanese name, and once under its English name. This makes it very easy to find what I want, even if I’ve forgotten or don’t know the Japanese term. Once I turn to the page in question, most Japanese terms are written in italics so I’m able to spot what I want fairly quickly. The section on kimono itself is small, only a couple of pages, but the sections on other topics (like ikebana, sado, etc.) are also only a few pages so there is very little danger of getting bogged down in a topic that you have no interest in for a long period of time. And there’s a little something for everyone with an interest in any aspect of Japanese culture. A word of warning though, the primary sources that Shirane refers to are poetry anthologies and there are countless references to different poets, poems, and anthologies. I have to admit, most of them went over my head. The one complaint that I have with this book is that it’s not an easy read. It’s an academic text and I found myself sloshing through and re-reading sections (sometimes multiple times) before I understood what he was saying. Shirane is very wordy in his writing, and I feel that he sometimes doesn’t connect all of his dots properly in the arguments that he tries to make. For example, in chapter five, he talks about talismans and talismanic function. He provides a definition of a talisman and attempts to connect it to the motifs that he decides to talk about (such as pine, bamboo, and cranes), but for me at least, he doesn’t make a clear connection between the definition and the motifs he’s talking about. It almost feels as if he is choosing deliberately challenging words as way of creating a text that is not easily accessible to the general population. Using a more appropriate word like auspicious would make the text much more accessible. Be warned, this is not an easy read. Even with this book being a challenging read, I still enjoy it. When I begin to research a new motif, this is the first book that I usually reach for. It explains things that are otherwise confusing about kimono motifs such as why autumn motifs are popular on garments worn in August (because August used to be an autumn month under the old calendar). Would I buy it again? Definitely. Would I read it cover to cover? Probably not. There are some chapters that I refer to more often than others, and there are chapters that are more readable than others. But overall, I’m very glad to have this book in my collection and I suspect I will be using it for many years in the future.